People Don't Leave Bad Companies, They Leave Bad Management. Micromanaging Into The Ground, page 42. "To manage a company is one thing. To integrate into and influence its culture is another. 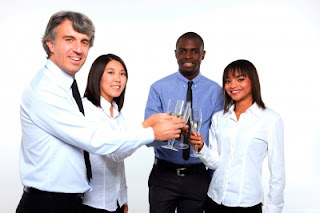 Respecting the group dynamic goes a long way toward motivating and inspiring a workforce. I worked for many years in various areas of the design business, from advertising to branding, from corporate events to slide production. It is labor intensive, and to accomplish anything requires designers and creative types with a commando style of getting the work done on each project. But over the years I noticed that the styles of management that worked best seemed to respect the culture, their workforce, the talent, and the environment. Those that did not went out of business. No one needs to be pushed or prodded to get their work done; college educated self-starters work just fine without someone standing over their shoulder. Yet I noticed something interesting: When the distance between upper management and the rest of the company was greatest, management took longer to discover internal and external problems. This gap has to shrink for leadership to be successful in the twenty-first century. How can you see the internal workings of your company if you don’t get closer? Here’s a case in point: One of the first jobs I had in New York City was at a slide production house. The main product was slides for small corporate presentations (this was way before PowerPoint). The new owner, Mr. G (not his real name), had bought the business lock, stock, and barrel. As a former executive with Otis Elevator, he felt it was high time some corporate structure was brought to the design field. Mr. G would walk around the office twice a day like the commander of a ship, wearing his Otis Elevator tie clip to remind us all where he came from and how powerful he used to be. Nevertheless, his twice-daily jaunts were always at the slowest times of production but at the peak time for sales calls. Work would slow down as his Australian accent pierced the office and he forced everyone to listen to his tales from the “real” corporate world. His opinion was forged by what he saw from us when on these walks. To him, we weren’t working very hard. And we weren’t; we were forced to stop what we were doing and listen to him! Since he never integrated himself into the company culture, he never found out that every 8:00 am shift change was filled with mounds of paper work, double tracking, and a check list that only the CIA could have invented, all for the sole purpose of keeping track of billings. Between 8:00 am and 9:00 am chaos reigned as messengers arrived to whisk the slides to their destinations. This was before the Macintosh become a household name and desktop publishing became the hot buzzword of the eighties. Back then slides were produced on a Genigraphics computer; run through a programmed slide camera; and processed through an E6 slideprocessing machine, a twenty-five-foot-long roller transport automated developing machine, filled and maintained with vat after vat of chemicals. Exposed film was fed manually to a feeder in a separate, attached darkroom. Once processing was finished, the film was cut and mounted into glass and plastic Wess Mounts during the night shift, then rushed to most clients’ desks by 9:30 am. Where was Mr. G during all this chaos? In his office with the door closed, only fifty feet away from the production station. I guess he was strategizing his big walk. His reality was out of touch with what was really going on. We were busy—busy making corporate America look good. The second time everything heated up was at around 4:00 pm, when production prepared to pass the day-shift work to the night-shift personnel. Paperwork was meticulously checked and discussed with each designer. Each color had a number that was checked, each typeface was checked, and, of course, we all pored over a set of full-color comps. It was all designed, programmed, photographed, and processed for the following day. Detail was what made this chaos run as smoothly as a well-oiled machine. Nothing could be left to chance. It was intense, high-pressure, deadline-driven work. How someone could see this as playing around is beyond me. As the year went on, Mr. G added a policy requiring many, many daily memos. But with twelve day-shift employees in a 3,000-square-foot loft space, it was really not necessary to pass a memo to the person sitting next to you. It was like having to pass a note from the commander of a submarine to his navigator before he could actually say the words—a complete waste of time. But that’s what Mr. G wanted, and to keep our jobs, we complied. What Mr. G never understood was that we were making slides for one small meeting after another, when the business of meetings was in fact a multibillion-dollar industry. Companies like Caribiner, MJM, and Weiss Watson were building full-scale meetings, with staging and lighting and giant sets as well as training, breakout rooms, and keynote speakers. The average cost for one of these large-scale annual meetings was around $2 million. In comparison, slide production, the physical designing and production of slide film, was a tiny component of the industry. Mr. G began to wonder why his company was not profitable, and how it was that all these other companies were making so much money. But because he did not respect his staff, no one was willing to help him make the leap from single-slide production to full-scale meetings. And people did try to help him for a time . . . but he was always treating his staff like peons—exercising his passive-aggressive behavior whenever the mood struck him. There were plenty on staff who had worked for the big production companies and knew how to handle large-scale meetings. His top salespeople and producers attempted to bring bigger clients through the door, but even when these bigger opportunities came Mr. G’s way, he would lose them. Unable to trust his key people and incapable of knowing how to talk with potential clients about a larger engagement, he drove his company into the ground. People began to show signs of insubordination, simply out of frustration. Many decided to moonlight at bigger production houses. Why bother working with someone when you know they don’t appreciate your contribution? In response, Mr. G began to micromanage his company into the ground even more. In a last-ditch effort to shake things up, he fired his top salespeople. Instead of paying for innovation, he became obsessed with cutting costs and instituting more bureaucracy and fear. To him, the design field was exactly like the elevator business—black and white, up and down, obey my commands or else. He treated creative production like a factory. Tightening costs seemed logical. But in an industry where the best creative people can command higher fees, cutting your most talented designers becomes a formula for disaster. Furthermore, by demanding memo after memo, Mr. G was actually putting up walls between departments that needed their communication to flow. Imagine that: He was enforcing bottlenecks. The company went under less than a year after I left. The employees were happy about it. If only Mr. G had integrated his management style into the organization instead of dictating it! He could have easily let his key people take the lead and win the larger pieces of business, but he couldn’t see the forest for the trees. He just couldn’t let go enough or trust anyone. Everything in his world required that all eyes, accolades, and rewards go to Mr. G.
I moved on and started working for some of the biggest companies in the world, producing their multimillion-dollar meetings while Mr. G couldn’t figure out how to get his clients to order more than fifty slides at a time. It didn’t take people very long to figure out that Mr. G was not an effective leader, and for leadership to work in any organization, it has to be admired. Since Mr. G was not listening to the marketplace or his key people, he sabotaged himself. We could have helped him, but hubris makes one blind. 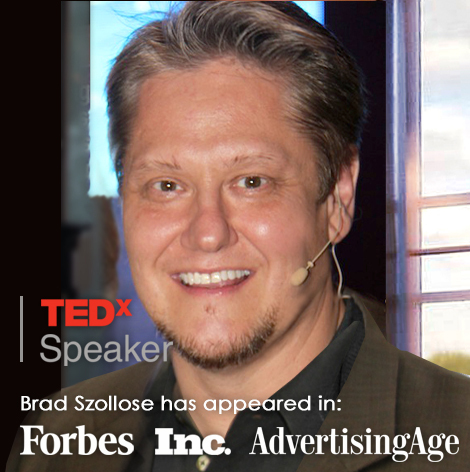 Brad Szollose is a global business adviser and the foremost authority on Generational Issues and Workforce Culture Strategies. 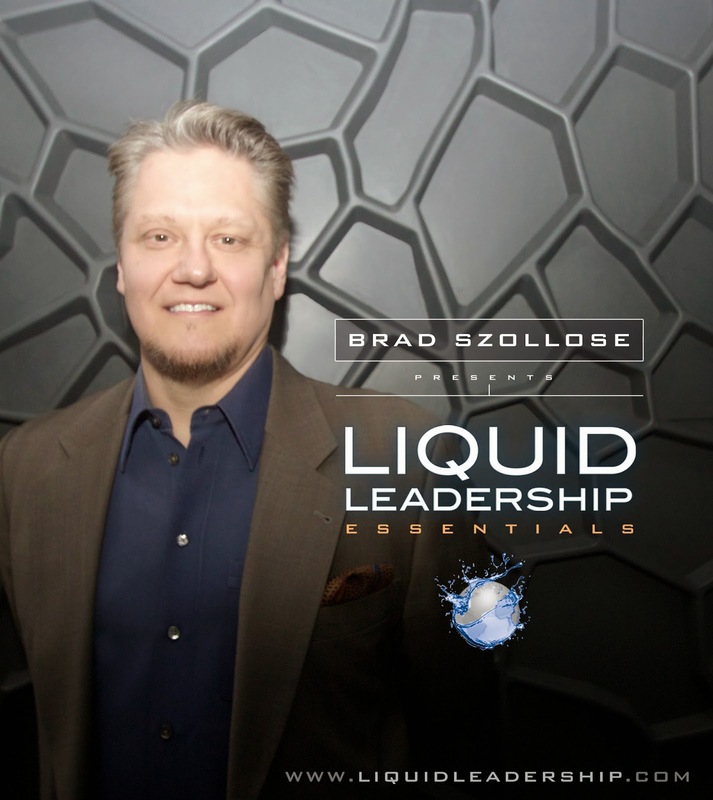 Author of the award-winning, bestseller Liquid Leadership: From Woodstock to Wikipedia, Brad is a former C-level executive of a publicly traded company that he cofounded that went from entrepreneurial start-up to IPO in three years; the first Dot Com Agency to go public on NASDAQ. His company K2 Design, experienced 425% hyper-growth, due in part to a unique management style that won his company the Arthur Andersen NY Enterprise Award for Best Practices in Fostering Innovation. 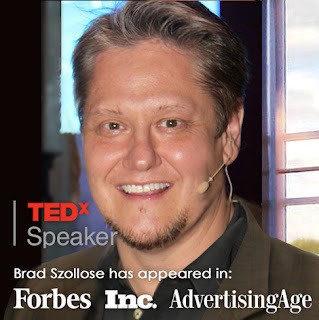 Known for his humorous and thought-provoking presentations, Brad’s keynotes and workshops are highly interactive, heart-warming, and filled with high-content information that challenge assumptions and help leaders and managers create a better work environment for innovation to thrive. Who The Heck Wants a Job?...When You Can Make a Difference. 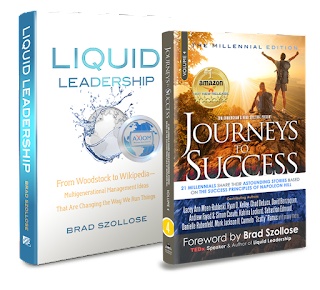 I am proud to say my award-winning, international bestseller Liquid Leadership is featured on CausePlanet — a professional development resource and time management tool for nonprofit leaders. But one of the best services Cause Planet provides to its members is executive summaries of business books relevant for nonprofit leaders. 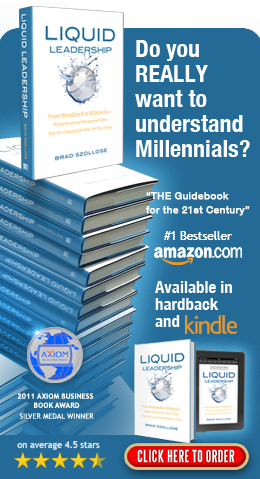 This is a great fit for me on several fronts; first, many of you are learning in your 24/7 connected day-in and day-out rush to squeeze a 28 hour day into 10, that time management is no longer about time... It is about managing ourselves, (wasn't technology supposed to free us up?). And secondly — I speak about this extensively in the pages of Liquid leadership — no one wants to just work for some company anymore. People want engagement, creativity, appreciation for their day-to-day contribution, and more importantly, a chance to make a difference. Of the planet’s 6.8 billion people, 4 billion live in conditions that are not much better than they were in the year 1500. Many of the children in these underdeveloped countries go barefoot throughout their entire childhood. Simply running, playing, or walking to the doctor all become high-risk activities when done without shoes. This exposure can cause cuts and bruises that have trouble healing, and when exposed to contaminated soil and parasites—a common problem in these countries—the majority of these barefoot children run the risk of amputation and even death. But one entrepreneur had the chance to change this. In 2006 while visiting Argentina, American traveler Blake Mycoskie came to the sad realization that most children he befriended in the South American country had no shoes on their feet. What was more astonishing was that none of these children had ever owned a pair of shoes. And because they had trouble walking to certain places, they could not attend school, where shoes are a prerequisite along with a school uniform. Without school, they would grow up to become uneducated adults, incapable of joining a global workforce. Since 2006, TOMS Shoes has been instrumental in giving more than six hundred thousand pairs of shoes to children in underdeveloped and developing countries. The consumer who buys a pair of TOMS Shoes does so with the full awareness that they are helping a child in an underdeveloped village get a chance at an education, as well as lowering the mortality rate. TOMS is one of the best examples of a twenty-first-century entrepreneur. Capable of helping the planet while making commerce fun and socially responsible... most young entrepreneurs are discovering it’s not that hard. 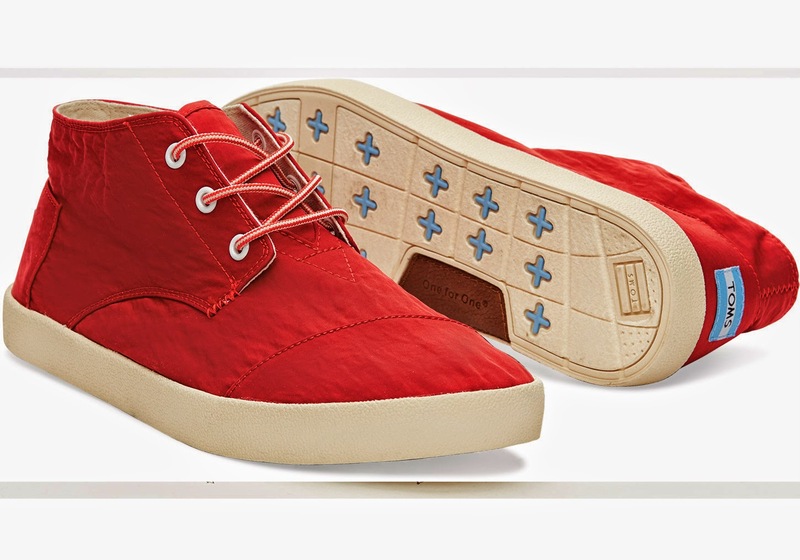 The company’s nonprofit organization Friends of TOMS also coordinates Shoe Drops around the world in order to drop off their shoes in remote areas and at the same time give employees and volunteers the experience of giving TOMS shoes firsthand. In March 2010, during a Shoe Drop in the northwest region called Shyira Diocese, Rwanda, TOMS, in partnership with Kris Allen (2009’s American Idol winner) and Arkansas- based organization Bridge2Rwanda, distributed one thousand pairs of shoes to children in remote villages. This was TOMS’ first personal visit to Rwanda, though they had been giving shoes there through another giving partner, World Vision, for some time. Kris sang and played guitar with the kids, inspiring them to laugh, smile, and dance. Now, another thirty two thousand pairs have been distributed by Bridge2Rwanda volunteers and local Rwandan organizations to kids in these same communities. To build a company that can survive long into the future will require constant diligence. This diligence comes from great leadership. And great companies never stray from their mission and foundation. They stand for something bigger at the core of their mission statement, while embracing the disruptive change from era to era. I cannot take credit for this model. It is from the oldest company in the world, the four-hundred-year-old Sumitomo Corporation. No one wants a job anymore. They want a chance to work for a company committed to changing the world...for a better tomorrow. Not just in words, but in actions...you know, a return to the human side of business. So why not place this kind of commitment at the beginning of your mission statement? PS: and a special Thank You goes out to Cause Planet for making a difference.